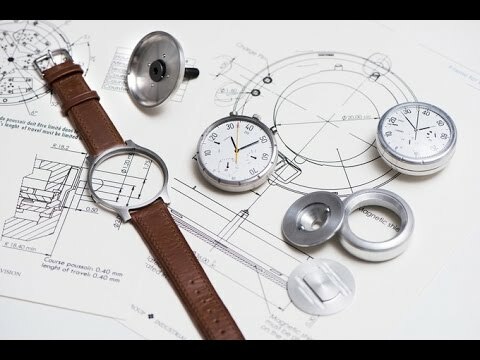 There are lots of bike computers and many smartwatches to choose from, but now for the first time there is an all in one device – a smartwatch that can be mounted on your bike to double as a chronometer, analog speedometer and distance calculator. Three years in the making, at first glance this classic looking timepiece seems like any standard analog watch. Features include Swiss-made quartz movement with six bi-directional motors, a 44mm case and two meters of water resistance. The rechargeable battery can keep going for 6 to 24 months (depending on use). Precision movement, hands, dial and case parts are entirely handmade by a manufacturer in the south of Switzerland. This is much more, though, than a simple timepiece. The three separate modes to the watch include: the Time Mode, Speed Mode and Chrono Mode. As you’ve probably guessed, in the Time Mode, Moskito functions as an everyday watch showing seconds, minutes, hours and the date. You will also find the typical smartwatch notifications – the device connects via Bluetooth with a smartphone to inform you of calls, sms, email and some third party apps. It gets much more interesting, though, when you pop the watch face out of the wristband. Screw it into the handlebar of your bicycle and switch to the Speed Mode. Alternatively, the unit can be secured to the front of your handlebars by adding a proprietary Moskito road bar mount. In the Speed Mode the second hand shows your current speed in mph or kph configurations. The minute hand indicates the total distance covered in kilometers or miles. The hour hand displays the current time. The small indicator that displays the date/time mode, now displays the average speed. The final mode is the Chrono Mode. This setting displays the travel time in hours, minutes and seconds. It also adds a stopwatch function. After your ride you can easily upload all your data to Strava or Garmin Connect. This well thought-out and stylish solution is aimed for bikers who want easy access to data about their current ride. There are two models to choose from – Classic and Fly – with the former sporting a stainless steel case and the latter featuring aircraft-grade aluminum construction. If you do a lot of cycling then the Moskito could be right down your alley. The company has successfully raised funds on Kickstarter, and is now working towards a June delivery date. CHF 152,389 to help bring this project to life. ← Will smartwatches save the Swiss watch industry?